Where is the Capital of West Virginia? 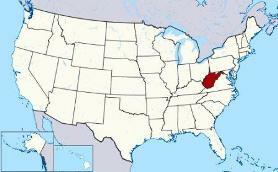 The Map of West Virginia (WV) shows the location of the state capital in the "Mountain State". West Virginia has 55 counties, and the capital of the State is Charleston. On a map, the capital city is always indicated by a star. Interesting fun facts about Charleston including its history, location, county, current population, size of the city and the nickname of Charleston, West Virginia. The Map of West Virginia and map provides an outline of the state, which covers 24,231 square miles. The size of the state's capital city, Charleston, is 156.6 square miles. Test your recognition skills of the map of the state, and knowledge of its capital, with our State Maps Quiz Game. The location of Charleston is in the Allegheny Mountains, at the meeting of the Elk and Kanawha Rivers in the south central part of the state. 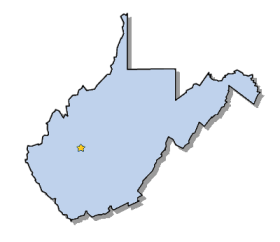 The city is located in Kanawha county, West Virginia. Each of the 50 states have their own capital city. The city of Charleston is the capital of the state. The capital does not have to be the largest city in the state, but is usually centrally located either geographically or by population. Fact 3: The population of the capital city - 125,583. Nickname "Chemicalville"
Fact 4: It is the county seat of Kanawha county. Fact 5 on History: Native Indian tribes were the early inhabitants of the area. The names of the West Virginia tribes included the Cherokee, Iroquois, Manahoac, Monacan, Nottaway, Saponi and Shawnee. Fact 6 on History: In 1773 the Bullitt family were deeded 1,250 acres in the area. The family sold the land to Colonel George Clendenin in 1786. Fact 7 on History: Fort Lee was the first permanent settlement was built in 1787 by Colonel Savannah Clendenin and his company of Virginia Rangers. Fort Lee was protection for the early settlers and also acted as a meeting place. Fact 10 on History: Salt brines from the Kanawha River were discovered in the early 1800's and the first Salt Well was created in 1806 which led to the Charleston area becoming one of the leading producers of salt in the world. The number of people, or the population of the capital city of Charleston, obviously changes constantly but the government statistics for the 2012 population of Charleston was 125,583, which provides a good indication of the number of inhabitants of the city. We hope that the interesting facts and information about Charleston will help kids and school children with their homework. Learn more by playing the States and Capitals Game.